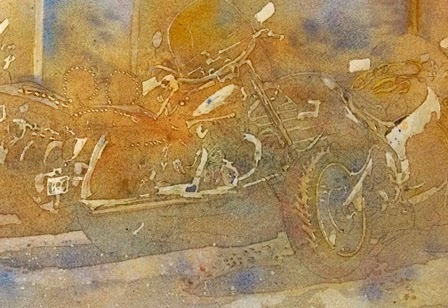 Cycles is part of my Transportation Series but also fits well with my urban paintings. There is something about the combination of organic, curved shapes with line that fascinates me. Perhaps that is why I enjoy painting urban, man-made objects. We humans seems to incorporate geometric shapes in the things we manufacture. Not quite so true of all handmade objects, but even in many of those (e.g., pottery, glass pieces) we tend to make them in oval or spherical shapes. I'll leave exploring the whys of this phenomenon to another time. This painting not only explores contrasting shapes (lines and curves) but also complementary colors (warm oranges and cool blues). Even my painting process was a combination of opposites. Starting with the pouring process I discussed in my blog Cycles - A work in progress, and the very detailed work I used during the later part of the painting to define the lines and shapes of the motorcycles. 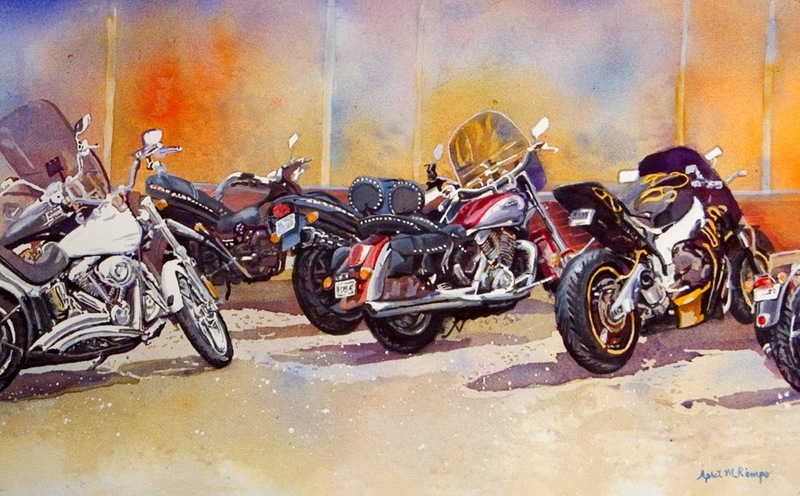 The reflections of the colors from the environment off the chrome on the motorcycles was great fun, especially since I had decided to use bright colors in the background and cooler lavenders and blues in many of the shadows. The repeated push and pull of warm and cool colors exists throughout the painting. I hope you enjoy this painting as much as I enjoyed creating it. The Spring paintings are just about out of my system now that the weather has improved. The threatened snow, predicted earlier this week, did not happen, so all is so much better in the world. Instead I started on a new painting that I plan to include in the "Modes of Transportation" solo exhibit I'll have later this year. So far the drawing for Cycles is done and the first two layers of poured paint have been completed. I wanted to show you photos I took after the first two pours to show how much the personality of a painting can change with color. The first image is shown at left. I wanted soft grays in this first layer with just a little tinting of lavender and orange-tan. The lavender is a result of Cobalt Blue mixing on the paper with Quinacridone Coral. The next photograph shows a closeup of the center of the painting where you can see there is a fair amount of variation in this layer, but only noticeable in the closeup image. I succeeded in achieving a fairly neutral gray underpainting, but was worried that the finished painting would be too muted if I didn't take a much bolder step with my next pour. I mixed a tan, orange, and Cadmium Red Light together in a cup and produced an orange I liked. That color excited me enough that I took out a different sheet of paper, thickened the liquid mixture with acrylic medium and placed some randomly on the paper. Next I took some tube acrylic Cerulean Blue added that to the paper and sprayed it with water to loosen it up a bit and let it run around. I ended up adding some white liquid acrylic in a few areas to create some lighter areas. I don't know what I will be doing with that full sheet, but I liked the color combinations and decided to use a much more subtle version of that for my next pour on Cycles. I slept on it and must admit each time I awoke that night I realized I was thinking about the painting. By morning I had a plan how I would use the colors I had experimented with to brighten Cycles without drowning it in so much color that I lost the first layer. 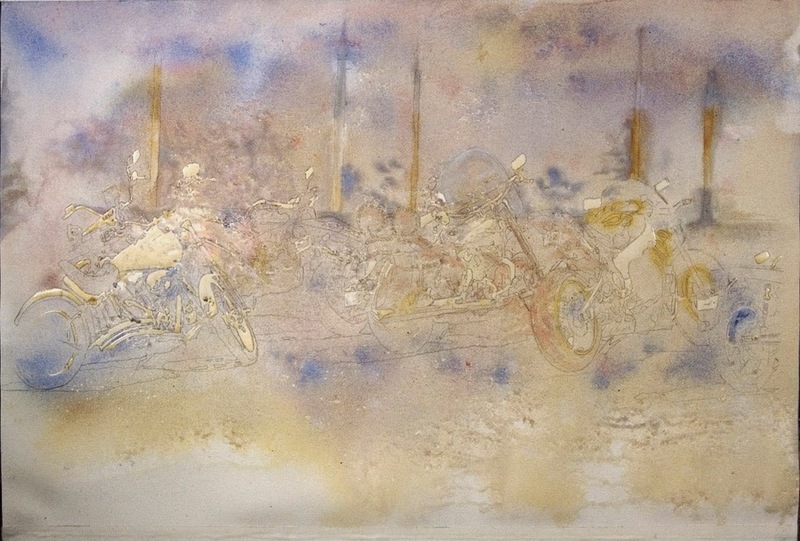 I had applied more mask to the painting to preserve linear areas in the motorcycles that needed the first lighter grays, but that didn't mean I totally wanted to obfuscate what remained of the first pour in areas I had not preserved. This is where transparency of the pigment is so important. So here is the result of the second pour. I started with an orange mixture similar to what I had created the day before and applied it selectively along with some Quinacridone Coral and a tiny amount of a yellow blend that was predominantly Quinacridone Gold. I wet these pours and tilted the support board to get the oranges to move about until I was happy with their placement. 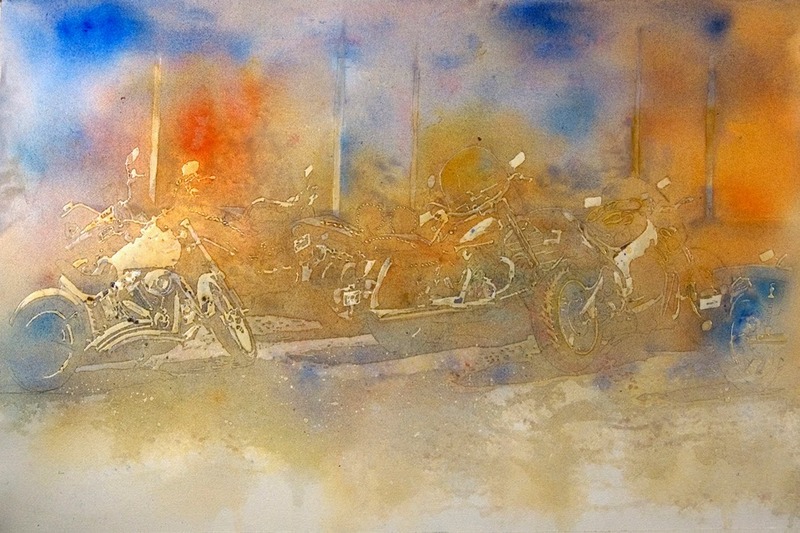 Next I added some Cerulean Blue in a rhythmic pattern between the orange areas and some French Ultra blue near the top, outer edges of the motorcycles, and a little in the shadow area below the bikes. I didn't want the foreground to get dark, so I tilted the board toward the top of the painting and let the color flow and intermix on the paper. I avoided using a brush as much as possible because using complementary colors at the same time does risk turning to brown. The light lavender blends you see between the blues and oranges are from the first pour. Since these complementary colors did not touch very much. Here is another closeup from the center of the painting where you can see how the Cerulean Blue and Orange shades intermingled beautifully and the underpainting colors shine through. The Quinacridone Coral is visible in the tire toward the right from the first layer; Some green blends were created from the second pour where the Quinacridone Gold and the blues combined. 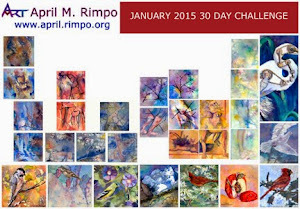 It is this wonderful intermingling of color that I love about watercolor and fluid acrylic. This painting is entirely fluid acrylic but since I handle it like watercolor, watering down the paint so it flows on the paper, very similar results are achieved. Now it's time for me to figure out the third, and likely last pour. I'll get to a medium dark value with the third pour and then I'll shift to my brushes to finish the darkest areas. My husband and I generally travel to New York City a couple times per year. Unfortunately that was not the case in 2014, but this painting from a photograph I took in 2013 allowed me to to travel there through my memories. As we walk around NYC I snap pictures frequently. I remember that as we were crossing the street I saw this fruit stand on the other side of the road and decided to get my camera ready. When the crowd parted I snapped a couple pictures. I'm not sure if my husband was even aware I took some photos because I paused only momentarily then caught up quickly. 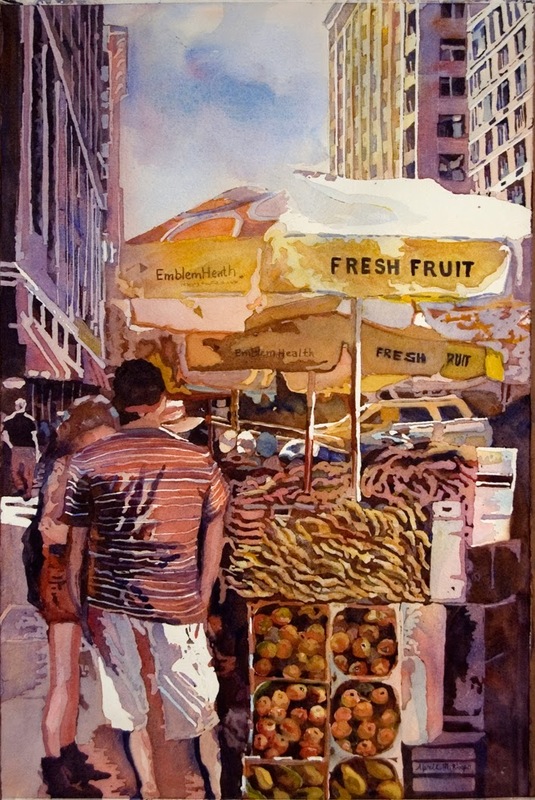 We have frequently bought fruit from these street side vendors while in NYC. The fruit is always great. Recently I met another artist who lives in NYC and she commented on all the wonderful farmers markets in the city and how she can buy whatever she wants and the produce is always super fresh and delicious. As she described the markets I remembered seeing a farmers market by Union Station, but we hadn't stopped. Staying in a hotel is not conducive to cooking and the small fruit stand vendors had met our needs. Not coming from a huge city I had never realized what great produce came to the city to supply the millions who live there. Next trip I'll have to check out the market, if nothing else to take photos for a future painting. Much of yesterday's snow has melted and the streets are clear. All the birds and animals are out and about. I'm sure nests are being built, spring cleaning of sorts for our feathered friends. The more timid animal life is peeking out and checking the air with ever twitching noses. This little bunny, partially under the cover of the woods, hasn't quite decided whether to venture further or not. 6:45 PM EDT today is the Vernal Equinox when it becomes officially Spring. It actually felt like Spring a few days ago. The warm temperatures had a few people out with no jacket and I even saw a few of the more rugged sort wearing shorts. I chose the light sweater, which I found unnecessary as the day progressed. All was well. It seemed light the birds in our yard were chirping a happy song, the leaf buds on the trees seemed just a tiny bit larger. A pair of hawks that live in our trees appeared to be beginning the nesting process. I even saw a vulture (not my favorite bird nor a lovely image of Spring) doing a fancy dance with his wings held out for another vulture trying very hard to attract her attention. I thought at last, Spring is here. 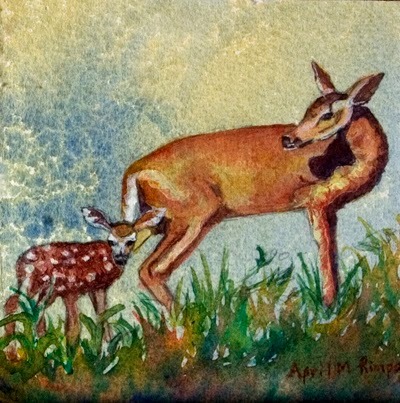 It seemed like doing this little painting of a deer with her fawn was perfect to celebrate. Fawns are normally born in Maryland toward the end of Spring in May or June, but for me the fawns are one of the symbols of Spring. So despite the fact that the weather decided to give us one more winter day, starting us out with more snow, I am still going to celebrate Spring. Although we do have about 1" of snow coating the trees it is beginning to turn to rain and I am still hopeful that by 6:45 PM EDT they trees will again be bare. Last year I joined the International Society of Experimental Artists, entered and was accepted into their 23rd International Experimental Artists Exhibition. At that time I had just started pouring fluid acrylic and my painting Moving Up had been the result of my first poured painting. While doing that and other poured paintings I noticed that the painting started out as a very interesting abstract and gradually built to the image I wanted to portray. This year, during the 30 Paintings in 30 days Challenge, I decided to create some non-objective paintings as the starting point for a series of yoga poses that I planned to paint. I used large sheets (40 X 50") when doing the pours so I could have a lot of variety to chose from when I later cut these sheets apart to make 8 X 8" wrapped "canvases" for the sections of the yoga poses. My goal during the pouring was just to make some interest patterns and color combinations. I had not yet drawn the poses, so there was no masking intended to preserve areas for the final paintings. After the backgrounds were done and I had drawn the poses, I selected sections of the non-objective, poured sheets that I thought I could use for the yoga poses. When selecting the 8"X8" sections I looked for lighter areas that could be formed into the person and textures that would help accentuate the pose. The next step was to draw the post across the segments and then add paint to help emphasize the human shape while still leaving each abstract segment as abstract as possible. 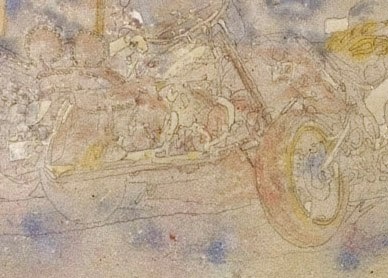 Until the four segments of "Inspiration", shown at left, were put together, it was difficult to see the figure. Even assembled it takes some looking to find her form in the painting. Being quite happy with my result I decided to enter this pose (there are a total of six poses made up of 21 8" X 8" panels) into the ISEA Member Virtual Exhibition. 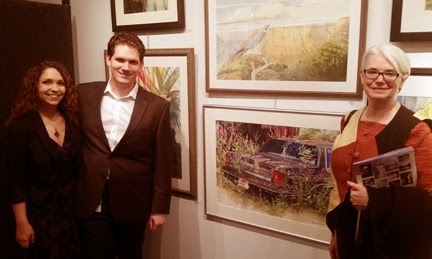 I was so happy is was accepted into the exhibit. To see all the other experimental paintings by going to the ISEA website. I think the work is quite fascinating in this exhibit. Do take some time to read the descriptions provided by each artist explaining why the piece was experimental for them, since being experimental is a personal experience. I am so glad their is a group like this that honors each artist's personal experimentation. Two of my artist friends also have work in this virtual exhibit. 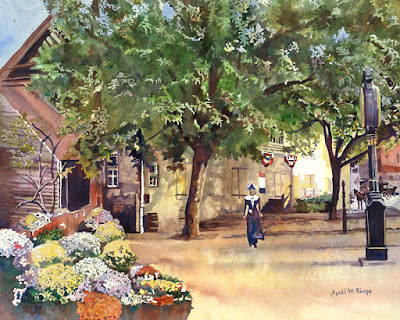 Please be sure to check out the paintings by Sue Marrazzo and Marilyn LeMay Patterson. 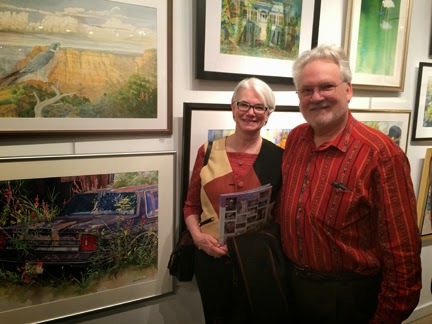 Sue Marrazzo also has a blog, so if you want to see more of her artwork check that out here. I've been able to attend the WAS-H International Exhibition reception for the last two years. This exhibit is very popular, as evident by the crowds that attend. There is literally standing room only starting about fifteen minutes into the reception. Last year I decided not to go to the studio/presentation area for the presentation of awards so I could enjoy the art in the exhibit, stepping back and being able to take it all in. 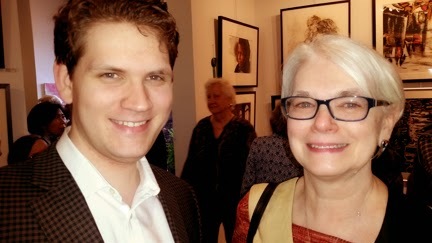 However this year the juror, Eric Wiegardt, was giving a talk during the presentation of awards and I wanted to hear it. Eric discussed his selection process to whittle down the approximately 300 entries to the 100 on exhibit. He explained that it was only subtle nuances that allowed him to select the award winners. His talk about the top award winners was fascinating. Eric’s in depth understanding of art and art history was evident. His approach was to select paintings that emphasized different artistic styles, historically important transitions in art, excellence in technique, and particular aspects of design and execution. As he stated not all paintings can excel in all the different attributes of an excellent painting but focus on different aspects. His selection showed the breadth of great art. Hearing his thoughts on these pieces added so much to the exhibit for me and I am very glad I didn’t miss it. Spending more time with Eric would no doubt enhance just about anyone’s understanding of art and history since his ability to explain his view point was extraordinary. Enjoy the picture of the reception with my family and me. Although our only resident animal is a dear kitty, Dusty, we live in an area were small and large animals abound. The domesticated farm animals include: lambs, goats, chickens, Guinea hen, cattle, and horse. Our wild animal visitors include: brown fox, raccoons, deer, ground hogs, and an occasional opossum. So when I want to paint an animal it is like one will either wander by our home or I can just walk to a neighbors to get some photographs. These cute lambs live about a mile from our home. When I did my Spring by the River painting I intentionally had an extra 6 inches of paper on one end, so as I painted some nice unplanned tints and textures formed on in this margin. 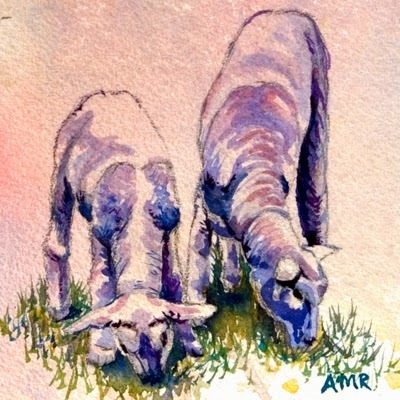 I particularly liked this piece that had pale pinks and grays and decided it would make a nice backdrop for the lambs. 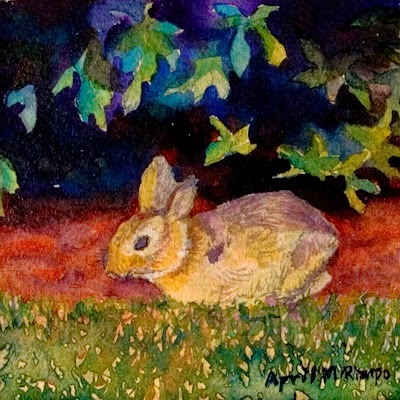 This small 4" X 4" painting on watercolor paper was mounted on a 2" deep cradled, wood panel becoming one of my "stackable" pieces perfect for Easter, a child's bedroom, a play area, or any little nook or cranny that needs a spot of color. I varnished the paper after painting to provide UV protection form the sun and to protect that paper from the elements. I've been wanting to paint this train station, now museum, for a while. However I've struggled with how to make it look interesting since the building and cobblestone were all similar in color. The front "courtyard" is a large expanse that seemed empty in my photographs. My first design concept was to transform the scene back to the late 1800s when the station was still in operation. This resulted in the addition of the horse drawn carriages in the distance and the woman in 1880s clothing, but it still needed more color and something to fill that courtyard area. Recently I decided I could add some potted flowers to the foreground, which not only adds some needed white, but also adds some brighter yellows and a place to repeat and emphasize the reds from the roof and distant building. I placed the flowers so they introduced an interesting curved shape, breaking up the large expanse in front of the building. I'm so glad I took my time thinking about the design of this painting. I believe the result is far better than my original plan. I'd love to hear your thoughts. Most years the Azaleas are in full bloom by Mother's Day in Maryland. I know that is two months from now, but I am ready. The Azaleas stand proud in my new painting Spring by the River. The white Azaleas are shaded with pale pastel shades of blue, violet, and pink, while the red blossoms vary from orange to hot pink and magenta. I have a bit of a weakness for the white blooms with pink centers. 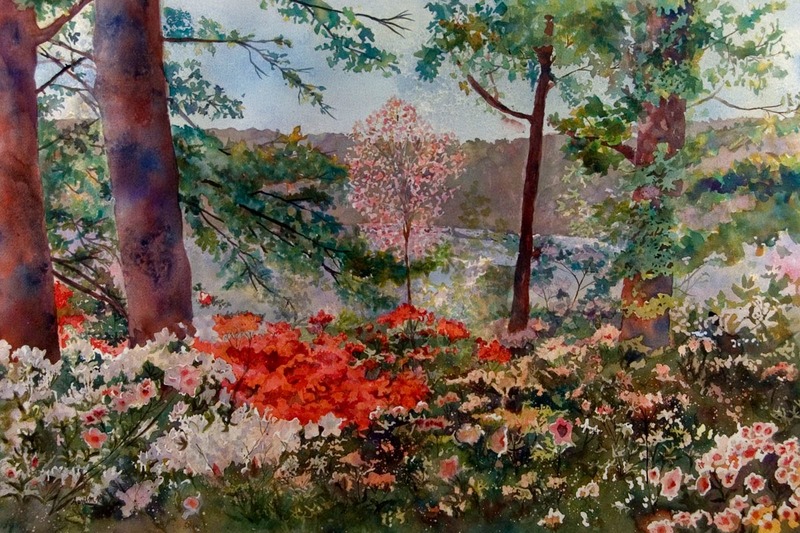 A fellow artist in our area has a show opening this weekend and I know she has paintings that include scenes from a local Azalea garden. We have not had an awful lot of snow this year, probably a little less than normal, but the cold has everyone I know extremely ready for winter to end. Well I do know a few friends who wish they lived in Maine, you know who you are, and are probably walking around in the 0 - 20 degree Fahrenheit days without a jacket. 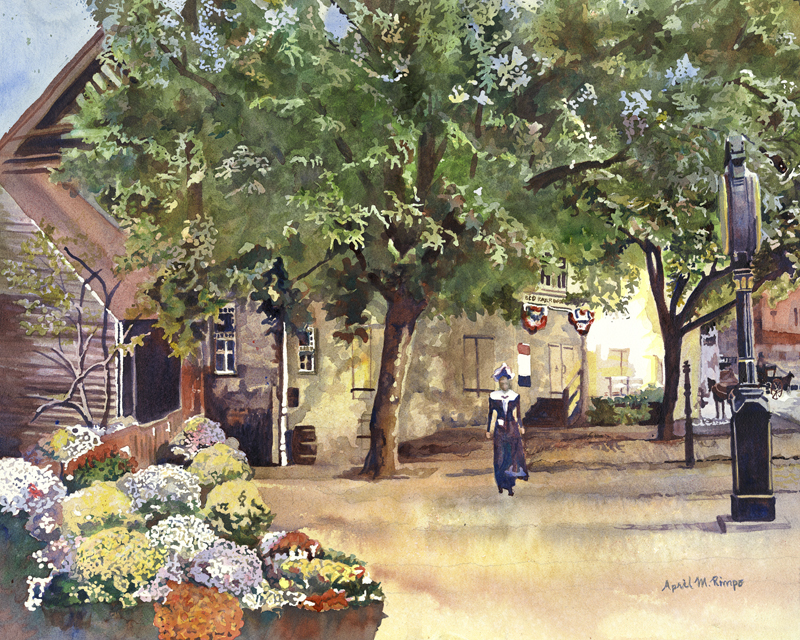 I have Spring fever, as you have noticed in my last several blog posts, so enjoy Spring through my paintings until it finally finds it way to our doorsteps.